Our existing wood deck was rotting and crumbling apart. We had the wood ripped out and replaced with Trex composite decking. We also replaced the railing with a low maintenance vinyl railing system to make it easy to keep everything clean. They rebuilt our staircase and covered the outside of the deck with vinyl and lattice. It looks great and is very easy to maintain now. 3 HELPFUL TIPS TO PREPARE YOUR DECK FOR WINTER Now that fall has finally arrived, most homeowners are taking a bit of time to enjoy just a few of the many things that these wonderful months of the year have to offer. Whether you are a big football fan, you enjoy all of the many upcoming holidays, or you just happen to be crazy about pumpkin spice everything…. Your deck is your paradise. Like a paradise, it should be beautiful and it should be built to last. As you begin on the journey to building your own paradise right in your backyard, the first thing you need to consider is the kind of material you’ll construct this paradise out of…. 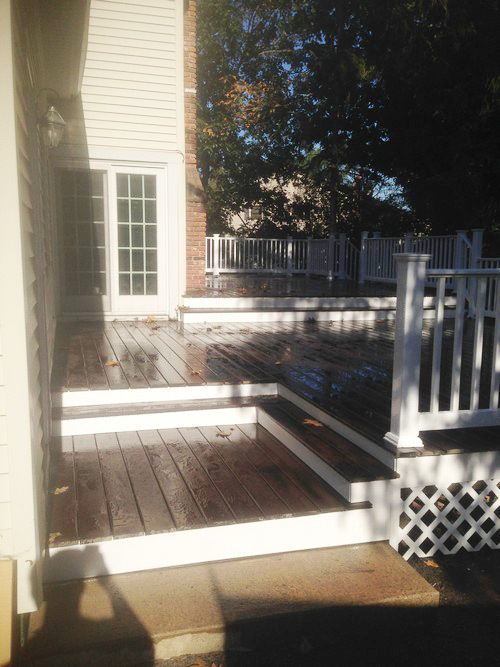 If you’re looking for a deck replacement service with new staircases and railing in Hillsborough, NJ, then please call 732-623-9790 or complete our online request form.